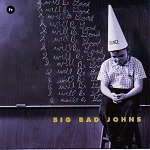 Let me start out by telling you Big Bad Johns is the epitome of rock 'n' roll. These cats are big and bold, wild and tough, but still have a soft spot. Their music bounces around with a rockabilly blow, jumps forward with a sizzling rock guitar licks, and comes in for the kill with a pop touch. And like Joe Frasier, these guys can knock you out with a mere glance. Keeping in the spirit of rock 'n' roll, the band begins with a punkabilly number by the name of "Hot Rods to Hell." With a danceable beat skimming the surface, the rest of song is intense passion and sweaty beat and beat keeping you in line and making you sweat until you can't sweat any more -- than making you work even harder. Then, on the hottest track on this disc, "Smokin' Joe," these fightin' men pay tribute to their idol. Yeah, you guessed it, the above mentioned Smokin' Joe Frazier. With a chorus that will quickly put a smile on your face ("...Never gave no praise to Allah..."), you can't help but get into this bouncy power-pop number and have the time of your life. I can't even imagine how many times I hit the repeat button on this track before continuing on to the rest of the disc. It just stunned me, because it was so melodic and poppy, but still had the fighting spirit of rock beating endlessly in every note. "Piece of Cake" just keeps the sweaty rock coming. The intensity and drive these guys commit to tape is amazing. I mean, they're so wild on the album; I can't even imagine them live. They've got to have the whole place up in arms, ready to faint. Bars have got to love these guys, the house must make bank on drinks when these cats get up on stage and make the audiences' mouths water. Keeping in line with the rootsy feel they've amped up, "Too Drunk (To Miss You)" serves up a country-tingled rockabilly number that will not escape your feet. Where as some of the other numbers are so powerful you may not be able to dance with them, this one is clearly a call to all those listening to get up on the dance floor and start to move. The guitar shimmies through the song with some hot riffs, while the rhythm section puts on a groove and makes sure your hips are shaking. "Listen Here Dog" is another straight-ahead rockabilly number that will have you up and shaking your body on the dance floor. The song has the chorus and follow-up hooks that'll find you singing the song hours later, and the music to make you get into it while it is playing. You just can't resist the charm and mayhem it offers in a tight three-minute package (two minutes and forty-six seconds to be exact). "Groovy Girl" puts to the rest the disc, but doesn't go out with a fight. More rockabilly finishes off the fun and wild time you'll have while blasting this disc -- whenever. Wake up and use this disc instead of coffee, or use it as a pick-me-up in the afternoon. Heck, use it as a weekend party releaser...just use it and have fun. I'll give it an A.